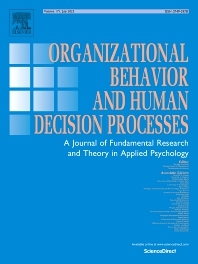 Organizational Behavior and Human Decision Processes publishes fundamental research in organizational behavior, organizational psychology, and human cognition, judgment, and decision-making. The journal features articles that present original empirical research, theory development, meta-analysis, and methodological advancements relevant to the substantive domains served by the journal. Topics covered by the journal include perception, cognition, judgment, attitudes, emotion, well-being, motivation, choice, and performance. We are interested in articles that investigate these topics as they pertain to individuals, dyads, groups, and other social collectives. For each topic, we place a premium on articles that make fundamental and substantial contributions to understanding psychological processes relevant to human attitudes, cognitions, and behavior in organizations.